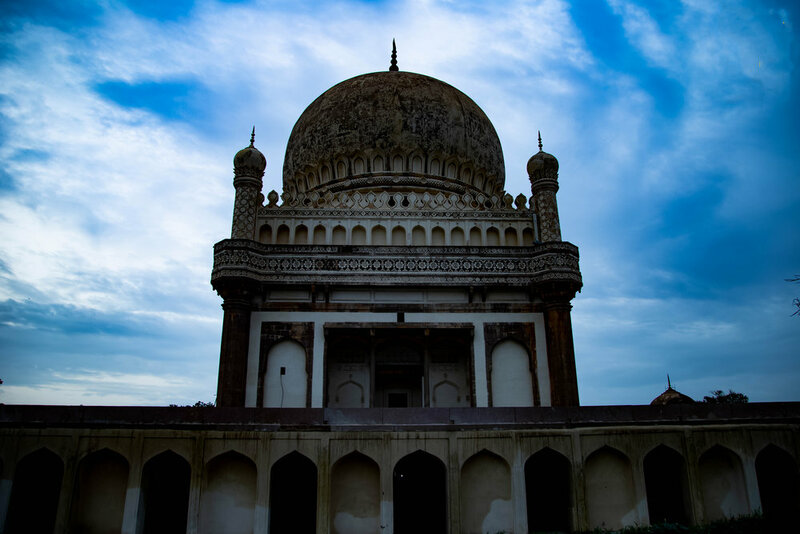 The Qutb Shahi Tombs are located in the Ibrahim Bagh, near to the famous Golconda Fort in Hyderabad, India. It have the tombs and mosques built by the various kings of the Qutb Shahi dynasty. The small tombs are of a single storey while the larger ones are of two storied. In the centre of each tomb is a casket which overlies the actual burial vault in a cellar below. The domes were originally overlaid with blue and green tiles, in which now remain only a few pieces. The tombs form a large collection and stand on a raised platform. The tombs are domed structures which were built on a square base surrounded by pointed arches, a different kind of style that blends the forms of Hindu, Persian and Pashtun. Carpets, chandeliers and Velvet Canopies were once furnished in these tombs. Copies of the Quran were kept on pedestals and readers recited verses from the holy book at regular intervals. Golden tops were fitted over the tombs of the sultans to distinguish their tombs from those of other members of the royal family. These tombs are now the venue for the Deccan Festival which is conducted by the State Government. One view of only tomb ..